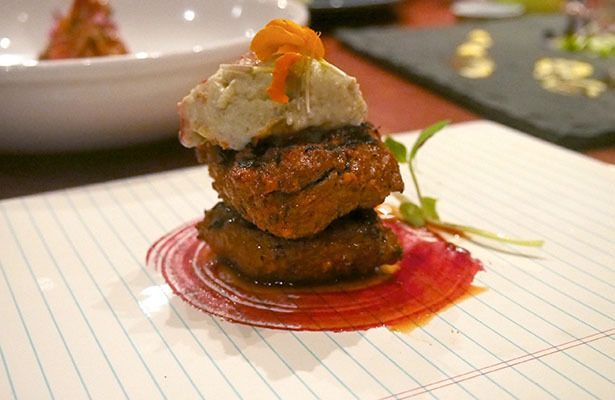 For many of us in Toronto, good Indian food is a hard thing to come by. We’re accustomed to buffet style or muddled flavours. 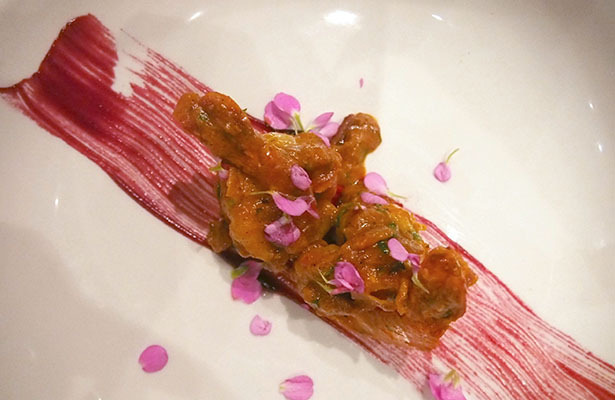 Thankfully, Derek Valleau and Harsh Chawla (both formerly of Amaya The Indian Room) have taken on what they believe has not been filled in Toronto yet: a fine-dining Indian food spot that leaves you comforting for more. 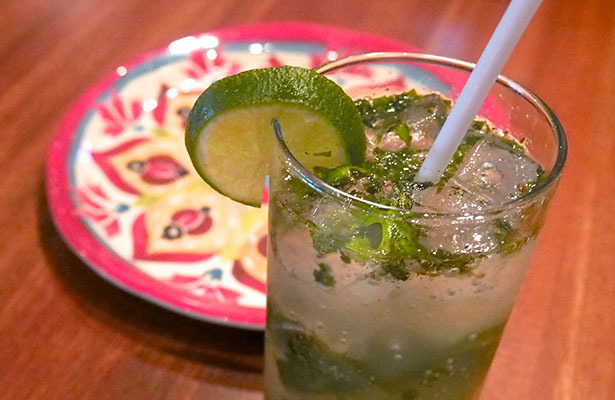 That spot is Pukka (778 St Clair Avenue West). The space is fresh and modern with reclaimed wood table and pops of green, purple and orange throughout. You’ll find lots of funky paintings and soft lighting, which gives it a bit of a romantic touch. I had mentioned to Derek & Harsh when I first arrived that when I lived in the St Clair area some year back, restaurants like this were missing. Derek told me candidly that the area and its residents have been quite kind in their support, especially over the winter months. When Yuli and I attended on a Tuesday evening, the restaurant had ever seat full. This was even on one of the coldest winter nights we were having. 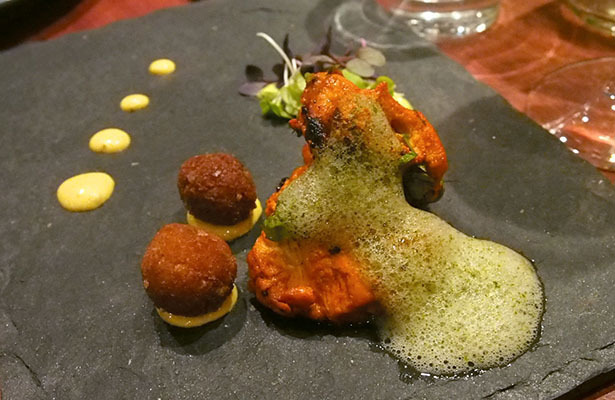 Pukka sticks to classical Indian cuisine. 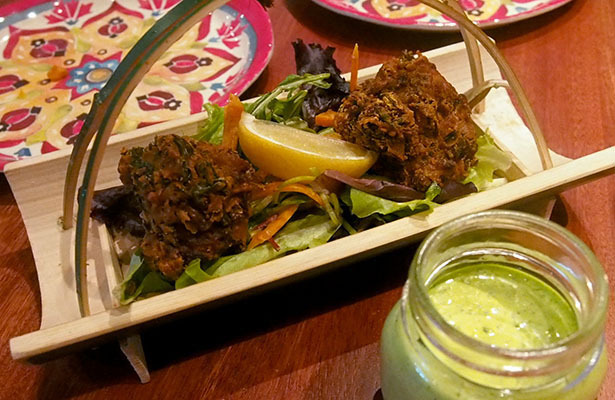 The kitchen is equipped with a clay tandoor oven and the menu is chalked full of seasonal, locally sourced ingredients while using rich spices and creams to take on their house-made curries and rubs. The menu itself is divided into snacks & eats. The snack portion has you covered with some intoxicating dishes such as: Baby Kale Salad ($8.90), which seems simple enough but with dates, cashew nut dressing and lotus chips – it brings it to a whole other level. The Vegetable String Chaat ($8.40) is serving up ripe mango and granny smith apple with a little bit of pomegranate seed just for flavour. Mix that in with some delicious yogurt and chutney and you’ve got yourself a winning dish. Another killer starter was the Chicken 65 ($9.60) which had all the feels of good fried chicken. But should you be in the South of India. This dish was spiced with curry leaf, red chili, tamarind, cumin, garlic and other spices and was pretty much, this was off the chain. I could really seem them developing this into a main. But that’s just my personal opinion. After inhaling all of these delicious snacks, we thought it would be wise to test some drinks off of the cocktail menu. You know to – ahem – cleanse the palette. First up was the Snapdragon ($9.20) which consisted of vodka, pear nectar, ginger beer & lime. It was sweet and fun, not too over-powering and reminded me of summer. Thankfully, it went so well with everything we were eating. Yuli decided to test out the Chai Town ($8.40) which had bourbon, chai tea, pomegranate liquors and bitters. From my sip, it was pretty delicious. Our servers (who were incredibly lovely and so helpful) brought out our dazzling course of mains, who informed us that most of the dishes were gluten-free. So fear not gluten-free fans, you are in luck! First up, we were brought out one of my favourite dishes of the night: Mushroom & Spinach Stuffed Paneer ($17.30). This dish was rich and bold and filling. Plus: paneer cheese is heavenly. Next up, the Pan Seared Sea Bass ($22.40) which consisted of coconut milk, curry leaves and roasted spices. 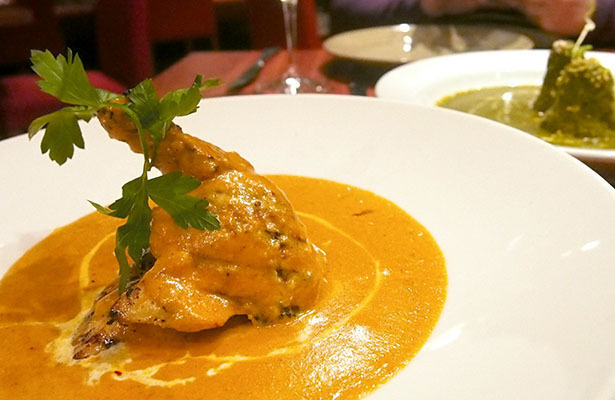 The fish was beautifully cooked and the aromas of the curry was hypnotizing. You know you cannot visit an Indian food restaurant without having Butter Chicken ($17.90) and while it was good, it was not Pukka’s best dish of the evening. Oddly enough, I enjoyed everything else so much more than the Butter Chicken. The tomato infused butter sauce was rich and delicious but the chicken was a bit dry. Nothing terrible but again, not my favourite out of everything that came out. Next up, we had the Madras Pepper Steak ($19.70) which was tender, juicy and served up with caramelized onion and coconut. It was beautifully rich and delicious. This was probably my second favourite main of the evening. Don’t forget, you have your options of sides too. We opted for the Green Beans ($8.70) with caramelized onions, coconut and turmeric and Rice ($4.60) served up in a lovely little jar (resealable) with so many aromatics. These pair deliciously with all the mains. 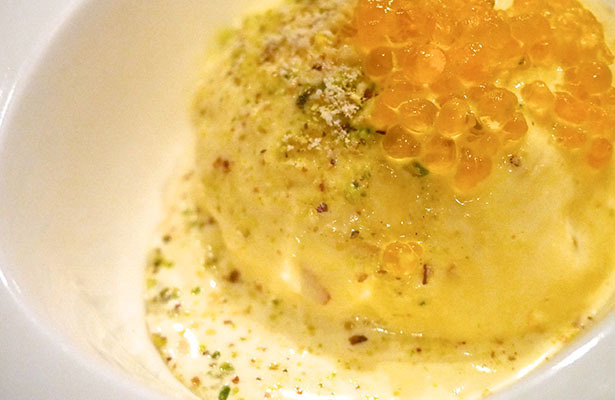 If you’ve left room for dessert, there is that. We opted for the Eton Mess ($7.60), which was a mess of all things delicious: rosewater-soaked meringues in pomegranate syrup and sweet lassi cream. Um, so into it. 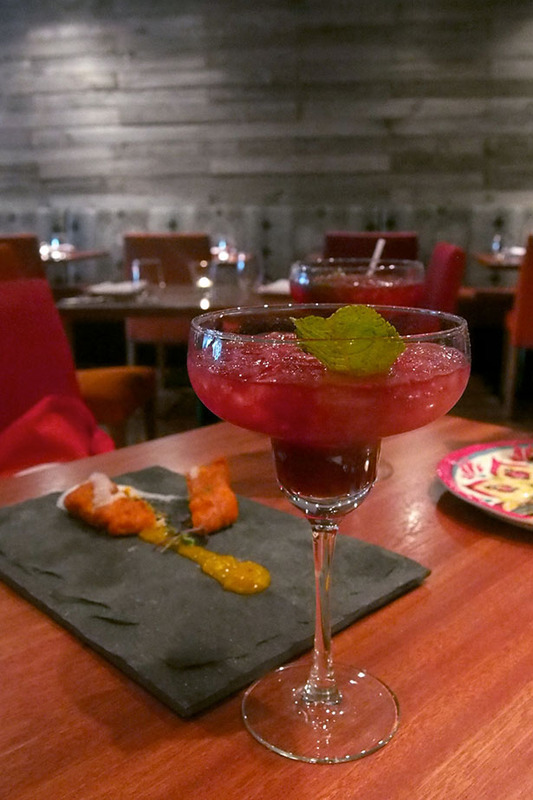 So if you’re craving authentic Indian and feel like making the trek to St. Clair West, make a date for Pukka. You will not be disappointed. Reservations can be made daily.